The Bureau of the Fiscal Service (“Fiscal Service”) promotes financial efficiency within the Federal government. Fiscal Service’s goal is to help other government organizations raise their level of performance through improved efficiency, transparency and accountability. The U.S. Navy required a cost-effective, easy-to-use funds management program that worked both afloat and ashore. The prior legacy system lacked convenience, required high accountability and suffered from process inefficiency. The new program needed to have both open- and closed-loop elements (for ashore and afloat use) as well as online and offline accessibility, all in a single reloadable card. Fiscal Service and Naval Supply Systems Command (“NAVSUP”) created Navy Cash®/Marine Cash®. Navy Cash®/Marine Cash® utilizes sophisticated smart cards that allow Sailors and Marines to access funds in a number of ways: on and off the ship, online and through dedicated onboard self-serve kiosks. They also have the ability to direct a portion of their pay into both their home bank account and their card. The Navy Cash®/ Marine Cash® card service offers a variety of security features including PIN protection and the convenience of instant replacement with full restored value if the card is lost or damaged. The program helps Sailors efficiently manage their personal finances with increased convenience and security. At the same time, it streamlines the accounting systems on ships and reduces many inefficiencies associated with cash and checks. Navy Cash®/Marine Cash® demonstrates tremendous cost-savings, and is a model for other government agencies seeking a cash management solution as Fiscal Service expands the program in the future. Fiscal Service is an organization within the U.S. Department of the Treasury created by the recent consolidation of the Bureau of the Public Debt and the Financial Management Service. Their chief goal is to promote the financial integrity and operational efficiency of the United States federal government through exceptional accounting, financing, collections, payments and shared services. One of the agencies that Fiscal Service partnered with to manage federal finances is NAVSUP, a command of the United States Navy. In the past, Sailors and Marines used a mix of cash, checks and cards while on ship and offshore for everything from mess hall and vending machine purchases to entertainment, education and postage expenses. However, this system of funds distribution and usage proved inefficient and inconvenient, and overall cost the government millions. The Navy required a program that could reduce the amount of cash their Fleet carried, and at the same time, prove to be efficient, secure and cost-effective. The program had to be flexible enough to work both afloat and ashore. Most of all, it needed to be convenient, functional and intuitive for Sailors and Marines. Cash and checks were the main methods of funds distribution at sea, and a system called ATMs-at-Sea provided the Sailors with a bank card to withdraw money. However, a number of disadvantages weighed down the system. Sailors found cashing checks on ships inconvenient as cash disbursing windows were open only at certain times. The overall process suffered from extreme inefficiency as money that circulated throughout the ship had to be counted as often as ten times a day, and a high degree of accountability for the ship’s Disbursing Office needed to be eliminated. Sailors and Marines also encountered the challenge of unsecure physical cash management created by a ship’s limited personnel. The legacy ATMs-at-Sea was a proprietary service confined to the ship. The logistics of sailing from port to port also created non-sufficient funds issues due to the processing time lag incurred by physical checks mailed from distant ports where ships were deployed. When looking at a card-based solution, Fiscal Service needed a program that had the dual flexibility of a closed-loop system for functionality at sea and an open-loop system for functionality ashore, all within a single reloadable card which had to be widely accepted around the world. The system also had to include online capabilities as well as offline accessibility in the event communications went down while the ship was at sea. To avoid having to manage a number of individual cards from various bases and issues with ATM maintenance, Fiscal Service decided to consolidate the cash management for the Navy’s surface Fleet for Sailors, Marines and other DoD personnel, and develop a single flexible, convenient stored value card service for the cardholders. A joint partnership between Fiscal Service and NAVSUP developed Navy Cash®/Marine Cash® in 2003. Initial rollout was completed in 2010. NAVSUP reached out to the Treasury to address the need for a highly-organized financial system for Sailors and Marines on ships. The departments discussed their requirements and the stakeholders’ needs, and MasterCard offered an innovative, out-of-the-box hybrid solution that added an open-loop magnetic strip in addition to the existing closed-loop chip. The idea was unheard-of and initially considered extremely radical. Implementation of the concept required education as well as process upgrades and maintenance. MasterCard was instrumental in introducing users to the Navy Cash®/Marine Cash® service with in-depth orientation and the distribution of training materials. The Navy Cash®/Marine Cash® service creates a technologically sophisticated electronic funds closed-loop environment (cardholders’ pre-load funds) across the Fleet for afloat functionality. The Navy Cash®/Marine Cash® card also provides open-loop pre-paid debit card functionality for use ashore. The cards use smart card technology so the chip works with the closed loop and the magnetic strip works with the open loop. Cards are issued prior to deployment, but can be issued/replaced on-site via instant issue. Information is stored and processed on the card so transactions can be authorized offline and then sent from ship servers to Fiscal Service’s financial agent where they are processed. Navy Cash®/Marine Cash® works with a dedicated onboard kiosk which allows Sailors and Marines to link with their home bank accounts and instantly access personal funds by transferring them from their accounts to their cards. The service also lets them manage their accounts online. Sailors and Marines can use the cards for purchases anywhere on the ship and, thanks to the magnetic strip, anywhere in the world MasterCard® is accepted. Sailors and Marines are provided the ability to direct a portion of their pay directly to the Navy Cash®/ Marine Cash® prepaid MasterCard feature. The implementation of the Navy Cash®/Marine Cash® service created a wide array of advantages for the Sailors, Marines and all DoD personnel aboard Navy ships, the Navy’s Disbursing Office and Fiscal Service. Navy Cash®/Marine Cash® cardholders enjoy a higher quality of life from the convenient and easy 24/7 access to their personal funds via the dedicated onboard kiosk and the online website. Through both PIN protection and other safeguards, Stored Value Card electronic funds and the prepaid debit MasterCard® strip are more secure than physical money. Navy Cash®/Marine Cash® reduces the need for Sailors to carry cash or checks, and cardholders can easily obtain foreign currency when off ship. The Navy Cash®/Marine Cash® card also enables convenient e-commerce and, with the option to automatically load part of their paychecks onto their Navy Cash®/Marine Cash® account, helps Sailors and Marines efficiently manage their personal finances. Even the very installation of the Navy Cash®/Marine Cash® service resulted in efficiencies for the Navy’s Disbursing Office. The previous system, ATMs- at-Sea, did not use the ship’s LAN, and the ATMs required independent cabling and servers. With the introduction of Navy Cash®/Marine Cash®, the logistics and IT specialists integrated the new system with the ship’s existing technology, eliminating the duplicative cabling and networking. By going from two cabling systems to one, the new service considerably reduced the number of logistics and technical support staff required on each ship and resulted in overall savings in costs and time. As more Sailors, Marines and other DoD personnel used their cards for all their purchases, Navy Cash®/ Marine Cash® reduced the cash carried onboard by 50% to 75%. It also eliminates costs associated with handling cash such as the extra weight of thousands of quarters in ship vending machines. By eliminating the need for check cashing and processing, Navy Cash®/Marine Cash® eliminates long lines at the ship’s Disbursing Office window and reduces Disbursing Office accountability costs. Navy Cash®/Marine Cash® also provides efficiency gains through reduced accounting workload and the ease of auditing electronic funds. Rather than the Disbursing Officer having to count physical cash multiple times daily, Navy Cash®/Marine Cash® is all automatically accounted for and rolled into the accounting systems. 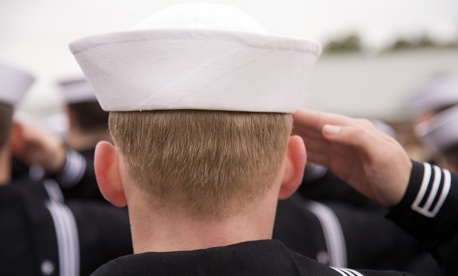 By reducing the necessity for excess personnel in the Disbursing Office through the elimination of many disbursing tasks, Navy personnel are repurposed for performing more critical ship functions such as analytics or mechanics. With a clear electronic audit trail, Navy Cash®/Marine Cash® reduces accountability costs, eliminates issues of human error, missing transactions and misplaced cash. Navy Cash®/Marine Cash® quickly proved itself to be an efficient and highly cost-effective program. The implementation of Navy Cash®/Marine Cash® yields great cost-savings for the Federal government. The Navy Cash®/Marine Cash® card program with MasterCard open-loop functionality gives Sailors and Marines on ships an easy, convenient way to access and manage their personal funds. It also provides the Navy’s Disbursing Office with a cost- and time- saving system that is functional, secure and flexible enough to be instantly issued and replaced on the spot as needed. Fiscal Service plans to leverage the learning from Navy Cash®/Marine Cash® and apply it in the future to other Federal agencies (both civilian and military) encountering similar challenges with cash management. To learn more about this program, contact your MasterCard account representative or go to mastercard.com/commercial. Navy Cash®, Marine Cash® and EagleCash® are registered trademarks of the U.S. Department of the Treasury, Bureau of the Fiscal Service. All rights reserved. MasterCard is a trademark of MasterCard International Incorporated.